Under the patronage of Her Highness Sheikha Fatima Bint Mubarak, President of the General Women’s Union, Chief Executive Officer of the Family Development Foundation and President of the Higher Council for Motherhood and Childhood 'Mother of the Nation', the sixth edition of FBMA International Show Jumping Cup will be held in Al Forsan International Sports Resort starting today and concluding on Saturday, 9th February. The FBMA International Show Jumping Cup is organized by the Fatima Bint Mubarak Ladies Sports Academy (FBMA), under the guidance of Her Highness Sheikha Fatima Bint Hazza Bin Zayed Al Nahyan, Chairwoman of the Fatima Bint Mubarak Ladies Sports Academy (FBMA), Abu Dhabi and Al Ain Ladies Club, in cooperation with Abu Dhabi Sports Council, the UAE Equestrian and Racing Federation (UAEERF) and the International Equestrian Federation (FEI). Leading national companies will be sponsoring the cup. The major objective of the Fatima Bint Mubarak Ladies Sports Academy (FBMA) in organizing these events of the cup is to contribute in strengthening the status of Abu Dhabi as a global leader in sports, empowering women in the local community as well as encouraging them to participate in sports and achieve their goals, ultimately inspiring young talents to engage in various sports including show jumping. This is directly in line with the UAEERF’s goals to develop show jumping as a sport and help UAE riders to not only develop their skills to the best of international standards but also to strive to achieve the best in the sport of show jumping. The sixth edition of the cup will include 14 rounds, six of which will be CSIL2* (two-star competitions for ladies only), two rounds of young horses’ category for horses that are six and seven years old (CSIYH1*), two rounds of children’s category for children between 12 – 14 (CSIOCH), two rounds of junior riders’ category for riders between 14 – 18 (CSIOJ), as well as two rounds of young riders’ category for those between 16 – 21(CSIOY). 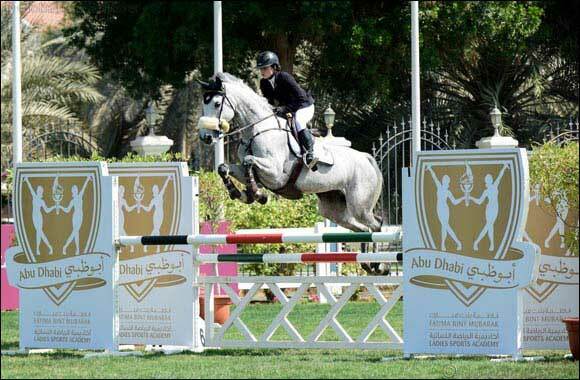 130 male and female riders from 25 countries will be competing for a total purse worth AED 650,000. Apart from the competitions, there will be plenty of non-equestrian events catering to the wider community and their families. The public will enjoy an all-new Equestrian Village, which has plenty of family-friendly activities, including equestrian-inspired games, free pony rides, various food trucks that cater to different tastes, as well as other entertainment programs that ensure there is enough for everyone to enjoy.